I’ve been wanting to do another ‘Five for Friday’ for a few weeks, because I’ve had the perfect topic. As part of our effort to acquaint ourselves with our environment, Ordinary Spouse and I took an oak walk a few weeks ago. Basically, we grabbed two tree guides and tried to identify all of the oaks we could find. The result of this little exercise could have been a ‘Five for Friday’, but I kept missing the Fridays. And it could have been a ‘This Week in the Forest’, but it’s now three weeks after the fact. The leaves are starting to change color (although the oaks are still mostly green), meaning I need to hurry up and get this posted. And so, you get a ‘Five for Sunday’. Bristle-pointed leaves, not deeply lobed, 5-9″ in length. 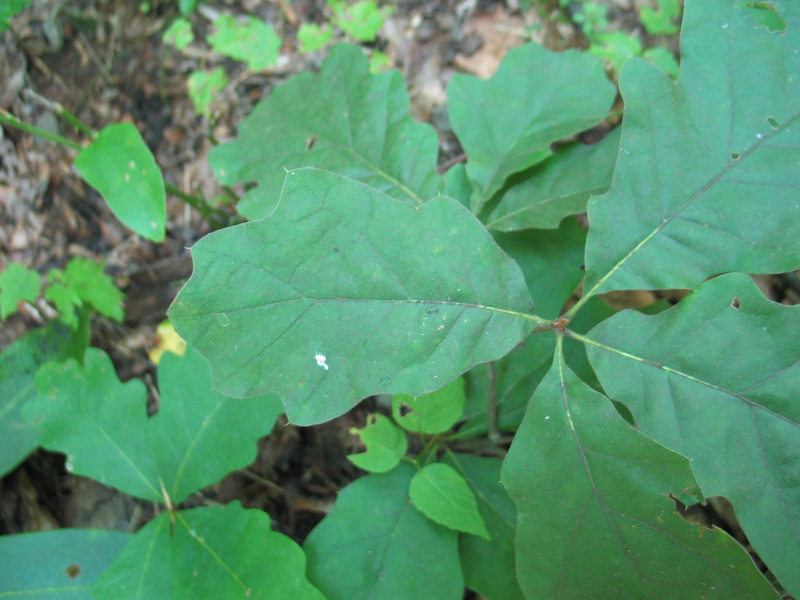 Leaves with rounded lobes and no bristles, lobes of similar size and shape. 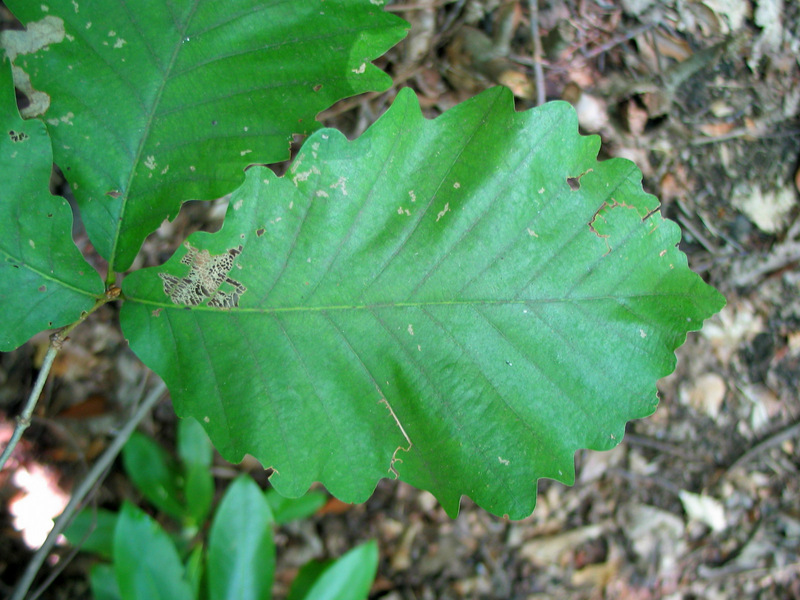 Broad, oval-shaped leaves with many shallow lobes. Also known as ‘Bear oak’. 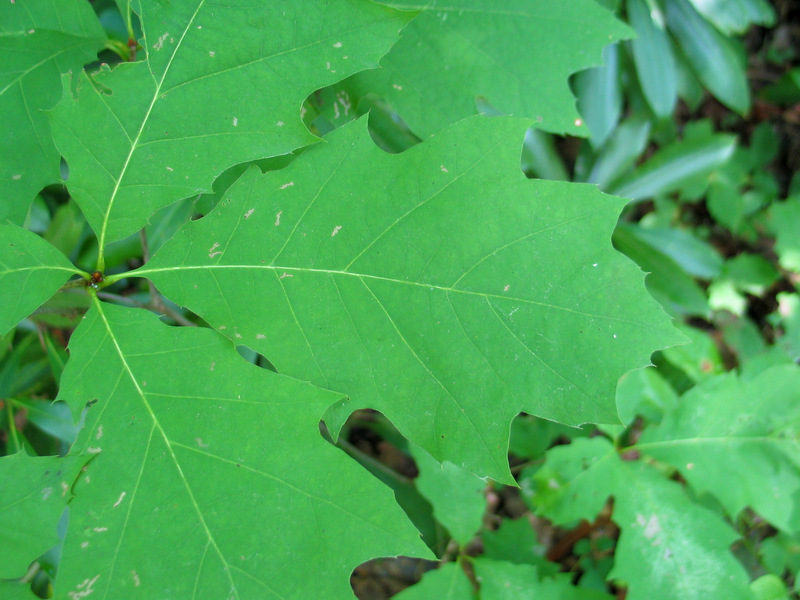 Leaves with bristle-pointed lobes. Fuzzy underneath. Deeply lobed leaves with bristle points. 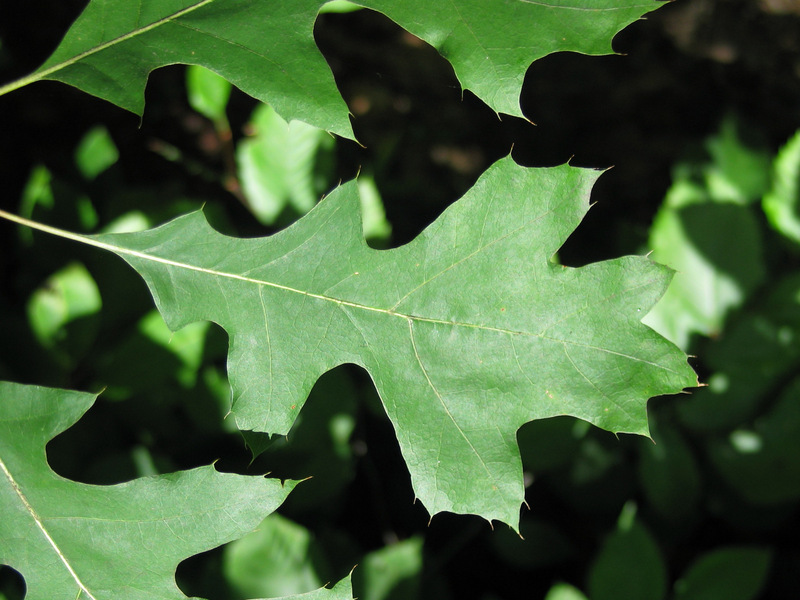 First, we may have actually encountered six different species, but making a positive identification of black oak (Quercus velutina) became a maddening proposition. For starters, it turns out that red, scarlet, and black oaks are closely related. Sometimes hybrids result. The leaves of the scarlet and black oaks look much the same, as well. And in common usage, people seem to use a number of names interchangeably. We’re hoping that two items will help us with a positive identification. Supposedly, the autumn coloring of scarlet oaks is much brighter than the black oaks, so we’ll be watching for that in a few weeks. And the inner bark of black oaks is yellow. 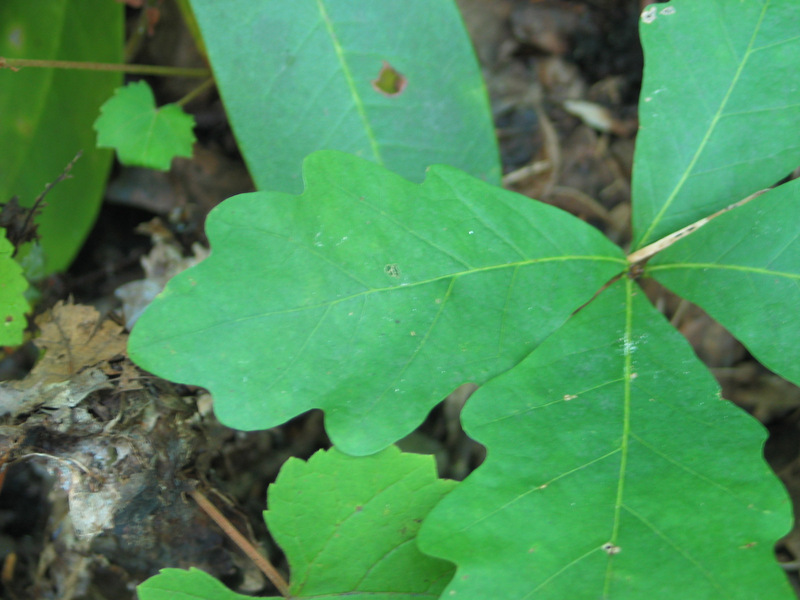 We’ve been doing some bark sampling, and so far we’ve only come up with the scarlet oak. No black oak. The other interesting note from our exercise: we found a cottage at Laurelville where all five of these species occur naturally around the parking area. So next time you visit us here, take a look around Danzig. The next item on our to-do list is a maple walk. We’ll see if that happens this fall or not. Two years ago, I wrote some haiku for the Year C Lenten lectionary passages. I thought that I’d try again this year with the scriptures for Year B. And we call him ‘Lord’. But God loves the poor. I’m a bit late for Halloween, but now I have an excuse for a “Five for Friday”. Without further ado, here are five Halloween tidbits. 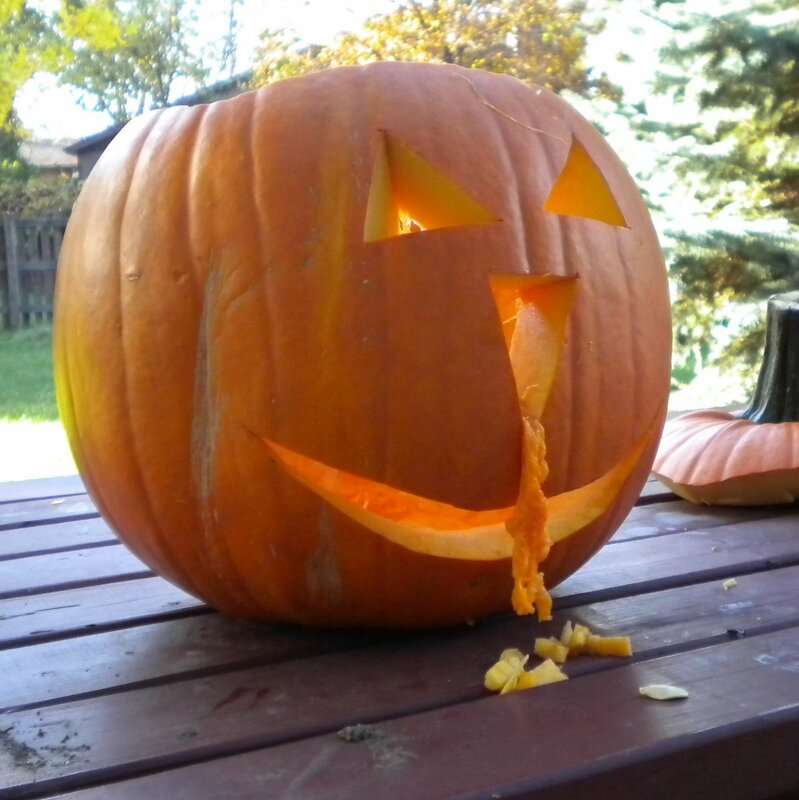 1) Our Jack O’ Lantern! This guy got a nasty cold at just the wrong time. Scary. When I was young, Dad and I rigged up lights and a sound system in the bushes outside our front door. When trick-or-treaters would venture up the walk toward our house, we’d flash the lights and make spooky noises. It was always gratifying when they turned around and ran off. 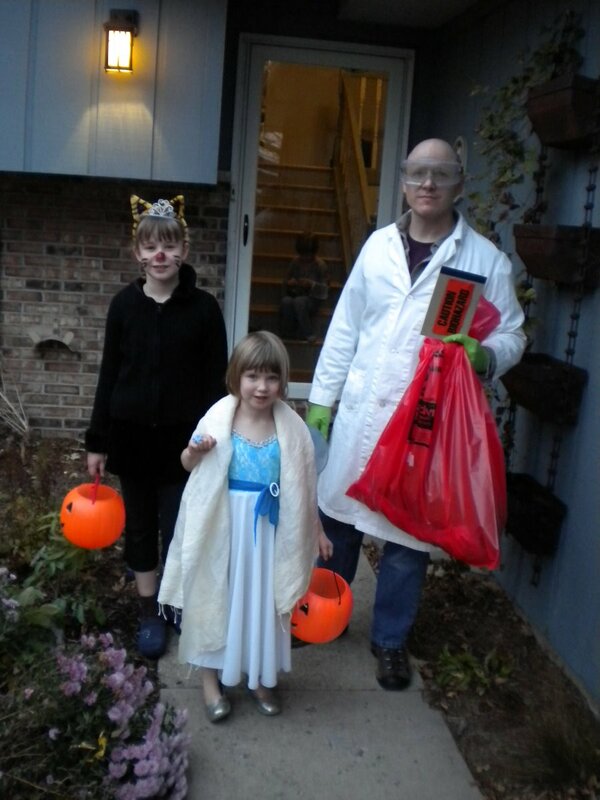 Oldest Daughter was a cat; Youngest Daughter was a fairy (you can’t see her wings); and I was a mad scientist (I actually performed acid-base reactions). Middle Daughter (on the steps in the background) was a blue jay. If you really want to give me a treat, get me a bar of Organic Panama Extra Dark Chocolate. Fair trade, 80% cocoa, 100% yumminess. So here’s the deal… I used to listen to CCM music* all the time. Between my first and second years in college, I had a pretty profound, faith-changing experience. As a result, I became more passionate about Jesus, and also more conservative. I got rid of much of my “worldly” music, and listened almost exclusively to CCM: Petra, Steven Curtis Chapman, Rich Mullins**, Susan Ashton… you get the idea. Over time, I’ve remained passionate about Jesus, but I began to find much of the “acceptable” Christian music to be theologically shallow and musically thin. 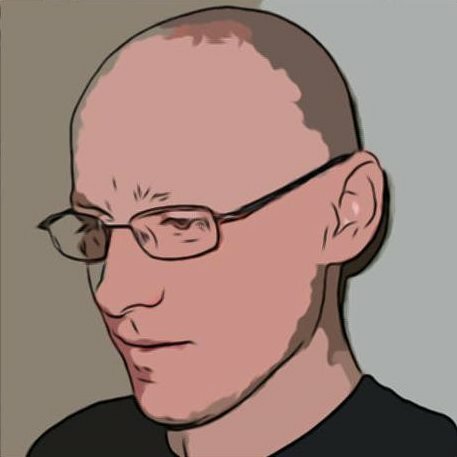 I stopped listening to Christian radio, because of the hit and miss quality of the songs. And I started noticing when the so-called “secular” music world produced songs that related to my faith. * “CCM”, if you don’t know the acronym, is Contemporary Christian Music. So technically, I should say “CCM” and not “CCM music”. Glad we got that out of the way. ** I still like Rich Mullins, but he’s the exception rather than the rule. And unfortunately, the world lost a good person a few years ago when he died. And that brings us to today’s “Five for Friday”. I don’t know how many times I’ve listened to something that Bono wrote and said to Ordinary Spouse, “Why can’t the ‘Christian musicians’ write songs like this?” So today, I’ve chosen five secular songs that reflect or challenge my faith. There’s a catch. I could choose music by U2 or Carrie Newcomer – musicians that clearly don’t draw distinctions between faith and life – but that would be too easy. So these five come from others. Enjoy! Yep – forgiveness. Reconciliation. That’s basically what Jesus came to teach us: how to be reconciled to God and to each other. A song about receiving grace (in the language of the Old Testament). Every time I hear this, I think Matthew 25. Five for Friday… Peanut butter and ??? 1) Marmalade – Pure yum. 2) Bananas – I think my mom tried to expand my horizons with this, once upon a time. It worked. 3) Honey – If it includes the honeycomb, all the better. 4) Nutella – Almost too rich to eat. 5) Apple butter – Sam Beachy’s, please. Honorable mentions: Marshmallow kreme. (I think it has to be spelled like that.) Also, these can’t make the list, since they aren’t sandwiches. However, I really like peanut butter with celery and (get ready for this one) peanut butter and mustard on ham. By the way – the earlier poll raises an interesting question. Why do people seem to spread peanut butter first? Of the responses so far, nine people spread peanut butter first. 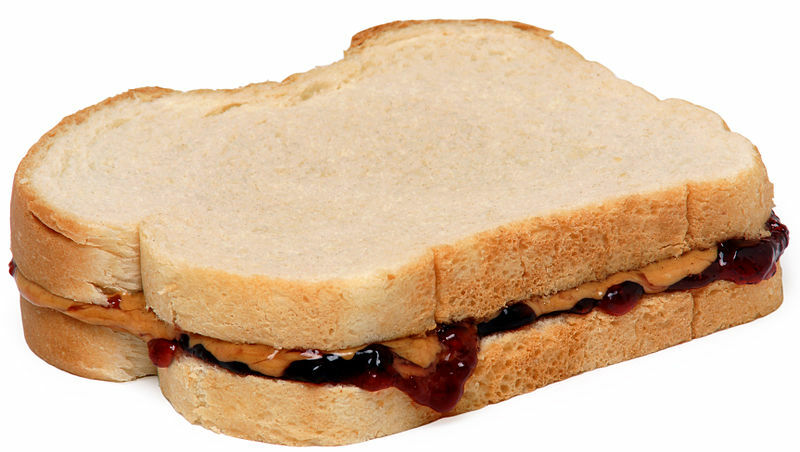 Three people spread either peanut butter or jelly. But no one always spreads jelly first. What’s up with that? If you’re going to use one knife, couldn’t you clean the jelly off of the knife more easily than the peanut butter? And yet, I’m guilty of being a “peanut butter first” person myself. And so, we contaminate the jelly jar with bits of peanut butter. So – how do you eat your peanut butter sandwiches? I’m afraid that this won’t be an overly exciting “Five for Friday” because my experience with food isn’t overly broad. Mostly, it’s just a chance for my father and me to think fondly of our shared sense of taste, while being separated by 600 miles. So here are my favorite uses for cheese (apart from simply eating it straight). Fresh mozzarella salad – Mix fresh mozzarella, tomato, basil, and balsamic vinegar. Voila! Pizza – I’m thinking fondly of white pizza (ricotta and mozzarella) on the east coast and goat cheese pizza on the west coast. French onion soup – More Gruyère, please. Ravioli. Or lasagna. I don’t care which. And just missing the cut: Asiago bread, quesadillas and Greek salads with Feta. Also – I reserve the right to modify my list. I’m sure I forgot something. With pepper jack missing the cut because Monterey Jack isn’t quite so special without the hot peppers.